Not Quite Donna Reed: Rise & Shine! Are you an early riser? Do you have the best of intentions in regards to getting out of bed before the children and find you often fail? Take heart~we all do at one time or another! Don't beat yourself up darlings, if your in a season of life with littles getting you up at night, it will be mighty hard to not want to sleep. And, if you need the sleep in this season of life you better get it! Tired mummies are cranky mummies. Now with all that said, it is better for a mum to rise before the family. God gave us the Proverbs 31 lady as an example, and if He thinks this rising early gig is a good thing, then it is. I find if I am up early and running out of steam later in the afternoon, a quick nap is wonderful! Find what works for your body and just do it, without guilt. "Let us begin each common day, dear Reader, with a ceremonial all your own: Carve out private time for yourself, at least half an hour in the early morning to collect your thoughts over a cup of tea or coffee, to pray or meditate, to read a page from an inspirational book, and to plan your day. Of course this necessitates that you rise earlier than the rest of the family. 'Early rising is one of the most essential qualities which enters into good Household Management, as it is not only the parent of health, but of innumerable other advantages,' Mrs. Beeton observed. 'Indeed, when a mistress is an early riser, it is almost certain her house will be orderly and well managed.' Trust Mrs. Sharp, you need this time to yourself. It is of unestimable worth for a mother to begin her day before the rest of the family. This time alone can become a treasured retreat of serenity that can prepare you to handle whatever the day might hold in store. It is far better for Mother to create a morning retreat than for her to beat a hasty one at day's end." One of my favorite things for the mornings is getting breakfast ready. 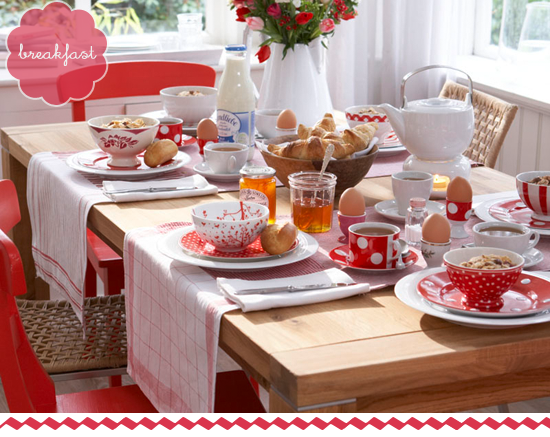 Oh, I love it when the table is a pleasant site to sit down to in the morning and a tasty breakfast is ready for my family. I remember fondly, my own Mum getting us breakfast before school. I also remember when she went back to work and breakfast was a hasty bowl of cereal or a poptart. In high school I just dashed out the door with a pepsi in the morning. I don't want that for my family, I am fortunate to be at home. But I do remember when I worked with two little girls and I tried my best to have a nice little breakfast before the day got off to a start. So, mums that have to work, don't stress, just give a bit more thought and time and you, too, can accomplish this. Not only is the aroma of a homemade breakfast a comfort in the morning, a pretty table just adds to the 'flavor' of home. Who doesn't love to sit down to a pretty table with a few special touches adorning it.? Does't it just relay the message to your family *your pretty tootin' special*! The beauty of the house is order. The glory of the house is hospitality. The crown of the house is godliness. Is this just too darling or what!? Red and polka dots, be still my heart! Simple, but the touch of a pretty napkin adds a bit of Bed & Breakfast charm. Oh my! 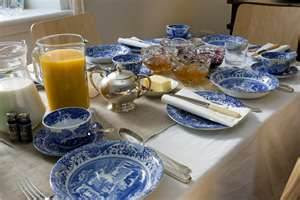 Being partial to blue willow this table setting just begs to be showcased on a leisurely Saturday morn. Now, don't get discouraged! I know most ladies are busy running in the morning.Yet, could we just take a bit more time first thing in our day and make the table, and breakfast, a bit more enjoyable. A box of cereal can look quite appealing if served in a glass jar with a cute scoop. 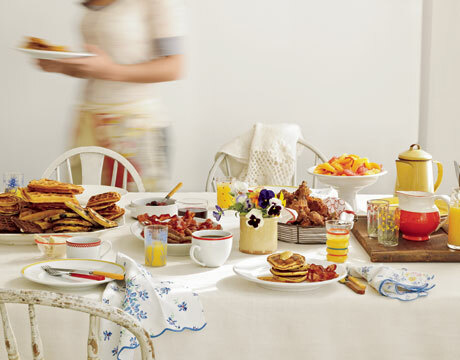 Orange juice in a glass pitcher or old-fashioned milk bottle would add a touch of farmhouse country charm. After dinner cleanup set the table again with bowls or smaller plates. Add a cloth napkin and little juice jars, small mason canning jars look super cute! Put out any nonperishable items such as cereal or croissants. Make sure the juice or water is ready to pour from a pitcher or glass milk bottle. Cut up any fruit and arrange in a dish and keep covered in the fridge until morning. Make as much as you can the eve before, like prep a breakfast casserole and have ready to bake first thing. 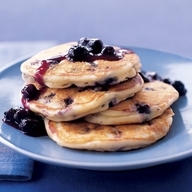 I admit there is nothing better to my mind than a fluffly stack of blueberry pancakes waiting for me in the morning. However, on the average everyday this may not be possible. But you can compromise by getting certain dishes ready the night before and just pop in the oven first thing in the morning. 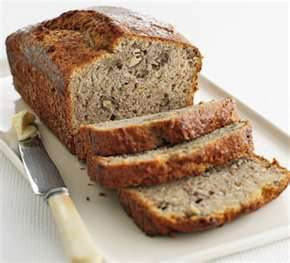 Homemade breads such as banana are a delight warm out of the oven with a pat of butter or slathering of cream cheese! Serve with a bit of fruit such as orange slices--yum! 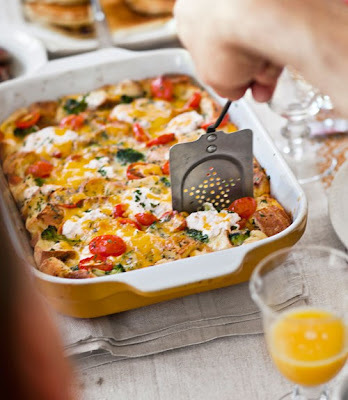 Whoever invented the breakfast casserole has my lifelong admiration. Not only easy, but healthy and quick in the morning. Here is my recipe for Blueberry French Toast Strata. I have taken this to many gatherings and they always ask for the recipe! Remember you are the keeper of the home, the homemaker makes their cottages a place of comfort, love, and rest. You have the most important job in the world. Never doubt your influence through the smallest of tasks, such as how you set the table, or the special touches you put on a meal. And do remember, when you rise early, spend time with the Lord first, before the computer or news or any media. Get quiet and pray for God's hand on your and your loved one's day. 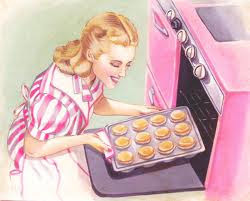 "Homemaking is the highest, most noble profession to which a woman might aspire." 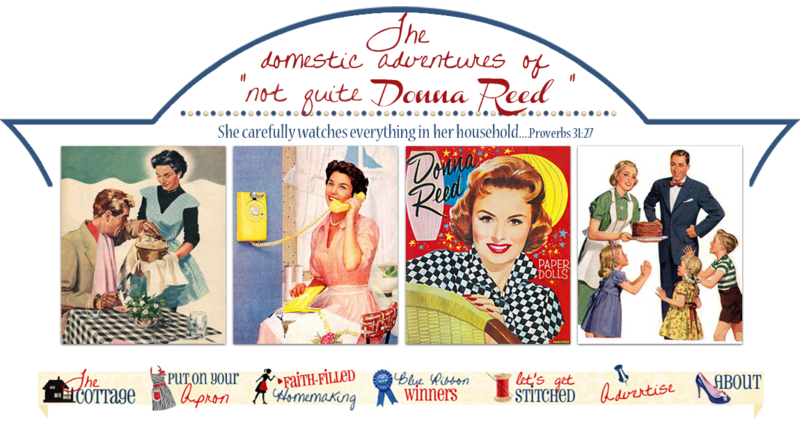 *Linked to Raising Homemakers, Women Living Well , and A Wise Woman Builds Her House. Wonderful post! Something I definitely need to work on! Only time I get up early is if I'm forced to. Thank you for your encouragement here. I LOVE being up before everyone else and getting a jump-start on the day, but it seems it never happens anymore. With two littles (one only 3 months old) I rarely get to sleep all night. And the baby is a night owl and the toddler is a morninglark, so its rare that I'm up before him. This is a season in life for you:-) I remember using my nights up to rock & pray over my little ones. The children need you rested and that means catching it while you can right now..LOL!